After a long while of reading things that were in no way Pratchett-in-origin, I returned to the Discworld series and my husband rejoiced. Right up until I started incessantly quoting it at him whenever a funny line came up. Which was quite frequently. Guards! Guards! 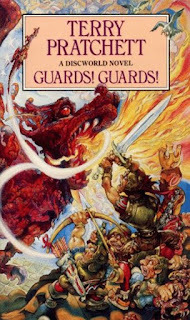 follows the misadventures of Ankh-Morpork's Night Watch, a much-maligned group attempting to keep order in a city where theft and assassination are well-regarded career options. Whilst they try to rein in a rather enthusiastic new recruit, a book about summoning dragons is stolen from the Unseen University and things start getting a whole lot more scaly and fire-breathing. I'm not going to beat about the bush. 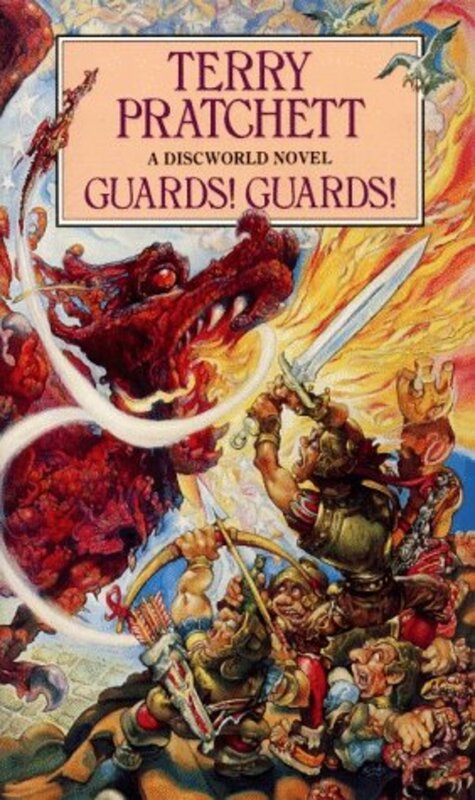 I loved Guards! Guards! from start to finish. I wouldn't have necessarily thought that the kind of grizzled noir detective tropes would work with more traditional maiden-eating style dragons, but somehow it does gel quite nicely. And it leads to some great character introductions for the Watch. I have been told that Vimes gets even better, but even at this early stage I really liked the weirdness that is the hardboiled alcoholic detective within a fantasy setting, so I can only look forward to more of him. Carrot is the 6 foot dwarf (by adoption) who is the first genuine volunteer to the Watch that anyone can actually remember, and his overly enthusiastic rookie status worked fantastically against the infinitely more cynical and self-preserving veterans. Sergeant Colon and Corporal Nobby Nobbs are somewhat less memorable than the others at the moment, but their generally pathetic and cowardly natures make for some great comedic moments. And then, be still my beating heart, there's Sybil. I thought she was the best thing about the book, bar none. An Amazonian mountain of a woman, who has more authority in her than that of the entire Watch combined and dedicates her spare time to breeding the most ridiculous specimens of dragon that I have ever seen in fiction. She is marvellous and I want to take her home. Also, it was nice to see Patrician Veternari start to come into his own. He is probably the only one who doesn't seem to be phased by anything that the plot decides to throw at him, and he manages to have one of the funniest scenes in the book whilst at the same time having probably the grimmest scene. He's just one of those characters.